I go by Vicious V and My Name is Real Richmond. The Term “Real Richmond” originated on the Bike Set way back in the early 90s. a lot of people don’t realize that Real Richmond was actually a person; My Uncle George Lane. he even got Real Richmond on his bike and that is what he is known everywhere in the bike set as and is the only one known by that name. I had a conversation with him about taking this to the next level and how we can spark a new movement in Richmond where we can unite as one under one name that is not affiliated to only one section of Richmond or any race. 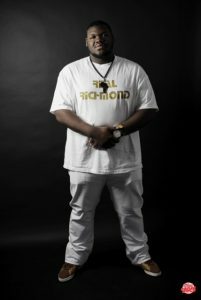 in 2015 is when i decided to introduce Real Richmond as a brand to the world. I have always been in love with music scene since i was little and my sophomore year of high school in 2005 i made my 1st song called “Step and Snap”. i kind of was on and off taking things serious until 2012 I did a show in LA and i was blessed with an opportunity of being confronted by a label rep of Beluga Heights records and he told me i had something special going on and to keep grinding and keep doing what i am doing and i will make it one day. from then on i have been 100 percent committed to my music and learning business side of the industry. i pretty much just took everything in on my own learning, researching, networking, and soaking up a lot of game from others. I saved up and bought all my recording equipment i needed and in 2007 i began making my own beats and started my own label “Slap Star Entertainment”. There were times where I had a whole team with me and the level and pace i was on verses the level and pace they were on was just on the same level so I pretty much been putting everything into this music and i basically took many losses on a lot but i kept going; everything that i have been through this far has been a learning experience. 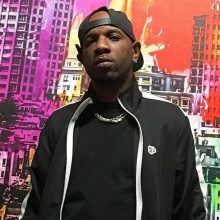 I am from Richmond, CA… Growing up in Richmond as compared to the rest of the Bay is that Richmond is a small town where everybody knows one another, everyone no matter what part you was from you was family some kind of way. No matter all the violence i have seen in my city it is and will always be home and i feel comfortable in my city. Since i was young i always looked at what others did and what went on around me and like what has always been said we are a product of our environment. I knew i never wanted to be like the rest. i seen what was the end result of many family and friends who lived that street life and it ended in 2 ways, either dead or in jail, and i never wanted that life. my uncle told me to keep my head in these books, hang around squares, and to leave the streets alone because even then he knew my possibilities and i listened. My Music is typically a mixture of what i feel. i always wanted to be that artist that has something for everybody. it should be no reason for you not to get one of my projects it’s always something for you on my projects whether you like: party, trap, conscious, or R&B. i had a song for you.